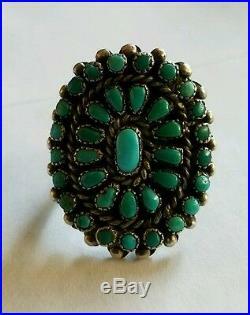 Vintage Zuni Sterling Silver & Turquoise Cluster Ring. Oval center stone, 13 teardrop stones, and 21 circle stones surrounding. 1 inch wide and 1.25 inches tall. The item "Zuni Silver & Turquoise Cluster Ring Vintage" is in sale since Tuesday, September 26, 2017. This item is in the category "Jewelry & Watches\Ethnic, Regional & Tribal\Native American\Rings". The seller is "carlierose" and is located in Porterville, California. This item can be shipped to United States, Canada, United Kingdom, Denmark, Romania, Slovakia, Bulgaria, Czech republic, Finland, Hungary, Latvia, Lithuania, Malta, Estonia, Australia, Greece, Portugal, Cyprus, Slovenia, Japan, China, Sweden, South Korea, Indonesia, Taiwan, Thailand, Belgium, France, Hong Kong, Ireland, Netherlands, Poland, Spain, Italy, Germany, Austria, Bahamas, Israel, Mexico, New Zealand, Philippines, Singapore, Norway, Saudi arabia, United arab emirates, Qatar, Kuwait, Bahrain, Croatia, Malaysia, Chile, Colombia, Costa rica, Uruguay, Switzerland, Iceland, Luxembourg, Macao, Martinique, Maldives, Oman, Pakistan.